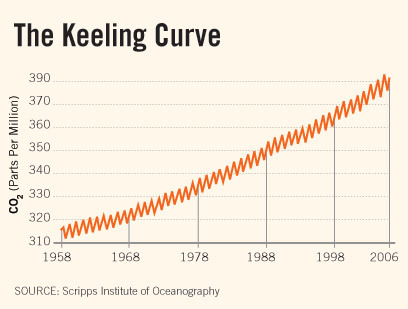 Revisiting The 'Keeling Curve' In the late 1950s, scientist Charles David Keeling began research that would prove to be a key signpost of climate change. In this archived story, hosts Madeleine Brand and Alex Chadwick talked with Keeling's widow and other scientists about the impact of Keeling's work. 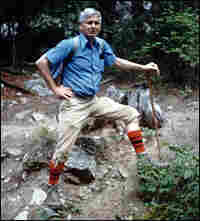 In the late 1950s, scientist Charles David Keeling began research that would prove to be a key signpost of climate change. In this archived story, hosts Madeleine Brand and Alex Chadwick talked with Keeling's widow and other scientists about the impact of Keeling's work. This piece was the first in the series "Climate Connections." It originally aired on May 1, 2007. 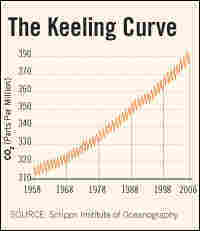 Oscillations in the Keeling Curve represent seasonal fluctuations in carbon dioxide levels. Svante August Arrhenius: In 1896, the Swedish chemist published the first major theoretical explanation of how two transparent gases, carbon dioxide (CO2) and water vapor, help trap the sun's heat in Earth's atmosphere and warm the planet. In On the Influence of Carbonic Acid in the Air upon the Temperature of the Ground, Arrhenius also recognized that burning fossil fuels added CO2 to what he called the atmospheric "hothouse." But he figured it would take humans thousands of years to have a noticeable impact. And he later predicted that a little extra CO2 would be a good thing: "We may hope to enjoy ages with more equable and better climates, especially as regards the colder regions of the Earth." Glen Thomas Trewartha: In 1937, at the height of the Dust Bowl, the University of Wisconsin geographer helped introduce the term "greenhouse effect." In the textbook, An Introduction to Weather and Climate, he explained that the atmosphere was like "a pane of glass" in a greenhouse... thus maintaining surface temperatures considerably higher than they otherwise would be." 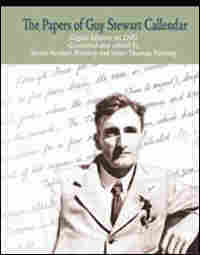 Guy S. Callendar: In 1938, the English coal engineer published one of the first studies to suggest that burning fossil fuels was warming the planet. In The Artificial Production of Carbon Dioxide and Its Influence on Temperature, Callendar figured that humans had added millions of tons of carbon dioxide to the atmosphere. And he assembled temperature records from more than 200 stations around the world to show that average temperatures had risen nearly 1 degree Farenheit between 1880 and 1934. 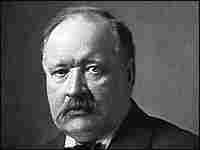 Like Arrhenius, he predicted rising temperatures would have benefits, from better harvests to less snow. 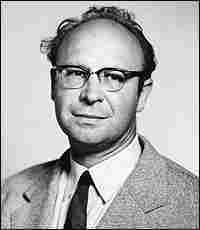 Roger Revelle and Hans Suess: In a 1957 paper, the two oceanographers concluded that "human beings are now carrying out a large-scale geophysical experiment" by pumping greenhouse gases into the atmosphere. They warned that there were many unknowns, including exactly how much carbon dioxide was in the atmosphere – and whether those levels were actually changing. They urged scientists to find out. Charles Keeling: In 1958, the young chemist installed a new instrument that could measure exactly how much carbon dioxide was in the atmosphere atop the Mauna Loa volcano in Hawaii. Over the next few decades, this instrument and others like it around the world confirmed that CO2 was steadily building up in the atmosphere. The graph that illustrated this steady increase – now called the Keeling Curve – became one of the most famous and influential scientific findings ever. In effect, the Keeling Curve launched the current debate over what to do about rising greenhouse gas levels.